The holidays are the best time of the year: delicious food, great gifts, fun parties, and time with family and friends. Unfortunately, it’s also the most expensive time of the year…right? We’re moms, so we understand what it’s like to shop on a budget. It can be stressful and hard to find gifts that are creative, meaningful, and affordable. That’s why we decided to host a December sale that we would love to shop if we were in your shoes (and we are because we’ve got our own gift shopping to do!). From today through December 25, here are five “In A Pikle” gifts you can get for less than $30. They’re adorable, affordable, and totally handy. Great for keeping tools on hand in case you’re “in a pickle”! Fill it with fix it tools, cooking tools, craft tools or hair tools. For the car, RV or ATV. This item is made of heavy canvas and durably vinyl. It’s perfect for the handy people in your life! That’s right! All Pikle covers (with interior pouches) are on sale for just $20! This is a great deal, so pick out your favorite designs fill it with essentials and you have the perfect gift for friends, the hard to shop for mother-in-law, or your kids’ teachers. It’s perfect for everyone on your list and it’s the gift that keeps on giving! The Bundle is the bigger version of the Pikle and is perfect for organizing baby gear, electronic gear, or activities for your kids. Treat yourself or someone you love! This bag is so cool! It combines the organization components of the Bundle with the look of a stylish purse. You can snap interior pouches into the bottom of the bag to organize your essentials or simply use it a regular bag. We’re big fans of this product and now you can love it too for just $30! Get all of the essential items for a busy life on the go with the Starter Pak. 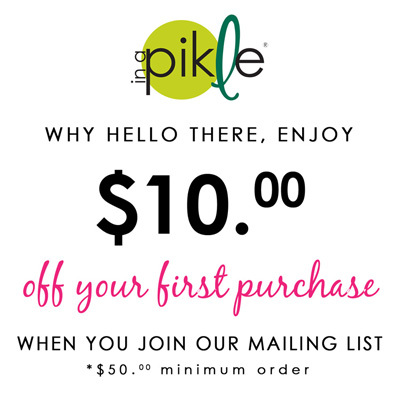 Over 20 items from hair ties to stain remover, it’s a great way to get someone “addicted” to life with a Pikle! What’s even greater is that we can help you stuff stockings with smaller items that are less than $5! Whether you use these things in a Pikle or Bundle, or just to keep your purse/car/desk well stocked, we promise they’re must-have items for the busy people in your life. These are the CUTEST little office supplies you’ve ever seen. This Pak includes a mini stapler with refill staples, a mini tape dispenser, and mini hole punch. They’re super lightweight and insanely handy for life’s little emergencies. This little bottle is perfect for the avid traveller or gal on the go! It’s easy use and even easier to take with you when you have a Pikle or Bundle to hold it. By “caddy” we mean “a cute way to keep your favorite lip gloss on hand.” It’s a fun and unique gift that is 100% perfect for stockings. This is the perfect little gift for the beauty guru on your list. We especially love that it includes earring backs – we’re always in need of those pesky little things! Where are our moms with young kids? This one is for you! Turn your Bundle into a compact version of your diaper bag with all of your baby must-haves… including wipes! Our special lip balm that fits perfectly with all In A Pikle products. Even with a busy life, it’s easy to stay clean with minimal packing or space. Everyone needs these little soap sheets! This little flashlight is tiny and bright and fits on a key ring. It’s an incredibly handy stocking stuffer for anyone and everyone! This is the perfect little tool for opening an envelope, cutting some twine, or so much more. You can never be too prepared, right? Life is crazy, right? How often do you find yourself in a pinch where you need something like sunscreen? Our SPF 30 sunscreen is small enough to fit in any “In A Pikle” bag, so help others be prepared and protected! So, there you have it! These are great deals that won’t last forever, so start shopping right away! Grab gifts that are creative, adorable, and handy for all your favorite people. …And, since it’s the season for giving .. snag something special for yourself too!